During the post-production of the most recent 007 film, Skyfall, rumors got out about the Aqua Terra watch that Daniel Craig would be sporting. Then shortly before the film premiere, Omega announced that two watches were to be featured in Skyfall: the Omega Seamaster Planet Ocean (ref: 232.30.42.21.01.001) and the (yet to be released) Omega Seamaster Aqua Terra Mid Size Chronometer (ref: 231.10.39.21.03.001). 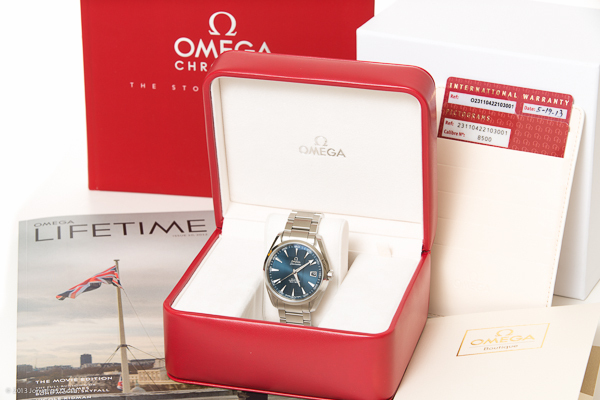 I saw photos of the Aqua Terra and the blue teak dial looked amazing in photos, and it looked like the same color dial on the Omega De Ville Hour Vision (ref: 431.33.41.21.03.001) aka “Orbis”. I had already seen the Orbis watch in person and it blue they used was amazing. 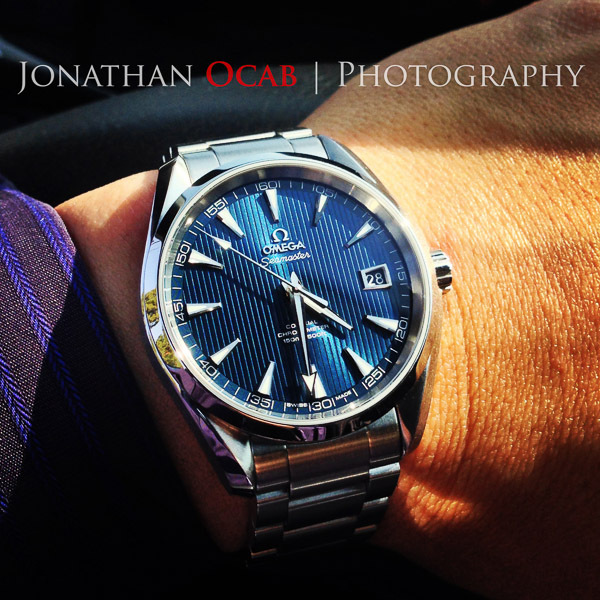 So I waited a few weeks after the announcement of the Skyfall Aqua Terra Chronometer and visited the Omega Boutique at South Coast Plaza (Costa Mesa, CA) to check it out. They had one and the blue dial was definitely amazing, but I did not like the 38.5mm case diameter of the mid-size Aqua Terra. I can understand why a mid-size would be desirable (e.g. fits better under dress shirt cuffs). 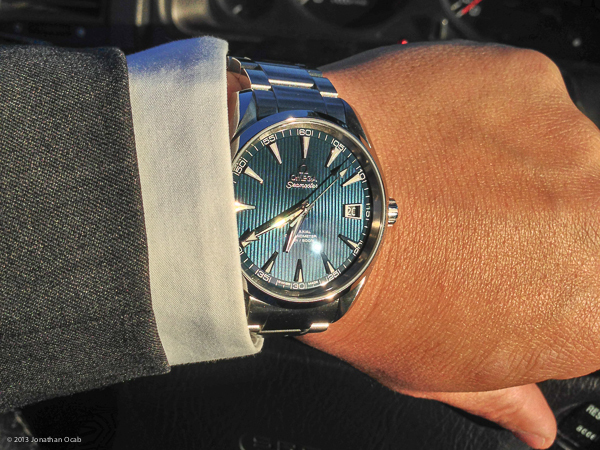 But I tried on a standard sized 41.5mm Aqua Terra (different color since at the time, the blue was not even announced yet in 41.5mm) and it fit perfectly fine for me under dress shirts. So my desire for the Skyfall Aqua Terra faded. 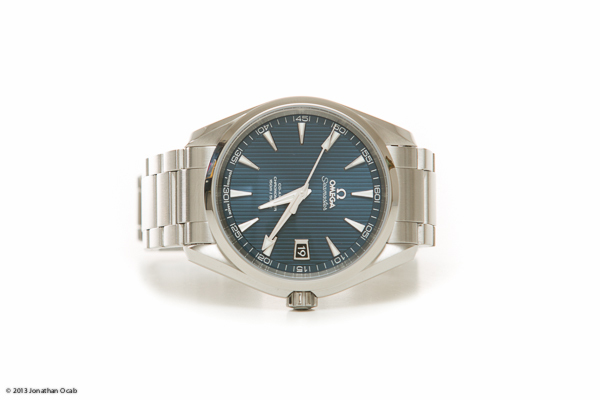 But several weeks ago, out of the blue, Omega updated their website with the Seamaster Aqua Terra Chronometer (ref: 231.10.42.21.03.001) 41.5mm, with the blue dial. That piqued my interest. 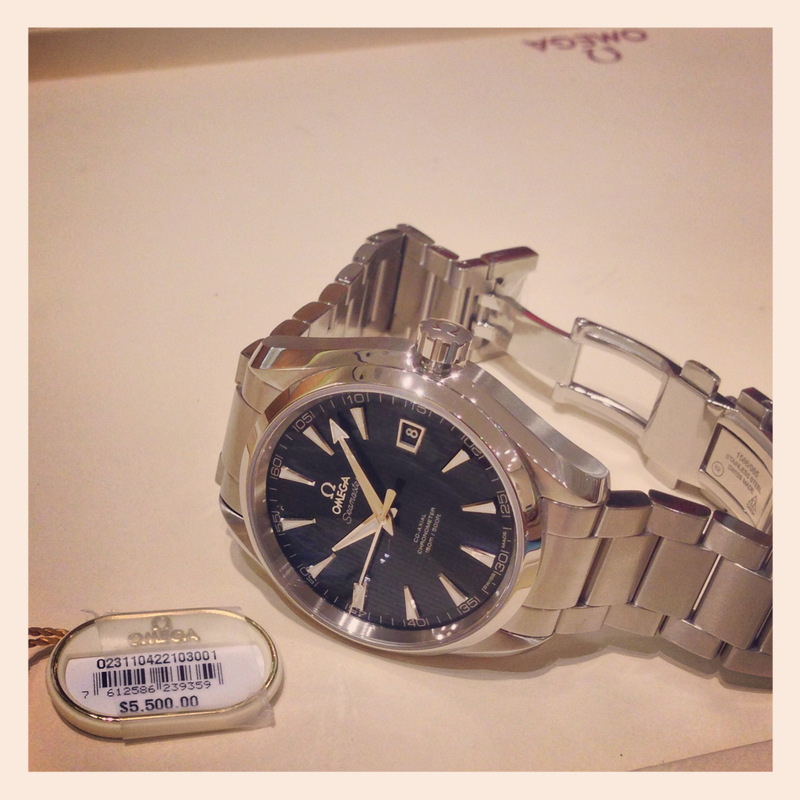 I finally got around to revisiting the Omega Boutique at South Coast Plaza and they had one on display in the store. I tried it on and it just looked amazing. Amazing enough that I decided to take it home. Watch photography is not my forte, but capturing the how stunning the blue dial is on the Aqua Terra is very difficult in general. You really have to view it in person. The Omega Seamaster Aqua Terra Chronometer has the 8500 Co-Axial movement which is an in-house movement. This particular AT also has a Silicon balance spring (Si14), which is now used on new production 8500 movements. The Silicon balance spring is meant to increase the accuracy of the watch movement as well as mitigate the effects of shock and magnetism on the time keeping of movement. The AT also has an exhibition case back, but it still maintains a similar profile thickness to my Seamaster Professional 300M with the 2500 movement (and closed back). The steel bracelet has a butterfly clasp design, where the side buttons release the main clasp and you simply use the finger tip to ‘pry’ open the opposite clasp. The Omega logo is etched in nicely on the clasp. While I do love my 300M and have no problems dressing up the watch with a suit, the Aqua Terra gives me a timepiece that will work more effectively in business and evening attire, yet can still be ‘dressed down’ for casual and sport attire. The blue dial of the “Skyfall Aqua Terra” is a sight to behold. In photos it looks good, but you definitely need to see it in person to take in the color of the dial and how it looks in various lighting conditions. The blue teak dial has so much depth and hue under different types of lighting that makes it a very desirable timepiece. As far as 38.5mm vs 41.5mm, I definitely feel that you NEED to try on both to see how you like each size on yourself. Don’t trust the wrist photos you see on the Internet. 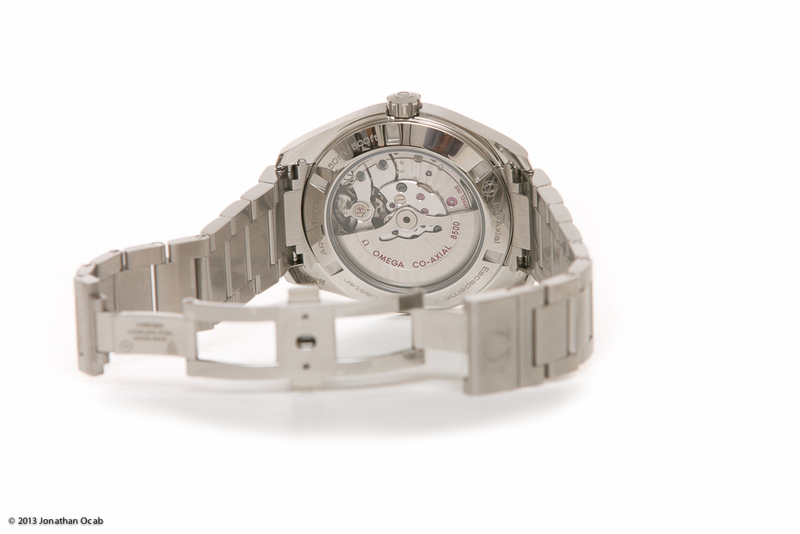 What size watch to get will vary from person to person, even those with the same wrist size. It’s all about how you like how the watch looks on you. Go to an authorized dealer, try on the watch, look at yourself in the mirror. Again, I have a 7″ wrist and I figured the 38.5mm would be great for me, yet when I tried it on, it just didn’t wear the way I expected it to wear. Addendum added 2013-05-20: Here’s a morning after wrist shot on the way to the office. Addendum added 2013-05-28: After over a week owning and wearing the Aqua Terra Chronometer, 41.5mm in blue, I can definitely say that I am glad I purchased this watch. I am very happy with it and it wears wonderfully. I’m still keeping my Seamaster 300M, but the Aqua Terra is going to be my work watch from now on since I just wears so much better with a dress shirt. That’s not to say my 300M didn’t dress up nicely, but it’s simply a matter of the AT dressing up better than the 300M. As far as dressing down, I definitely see the 300M being a better ultra-casual watch (e.g. shorts and t-shirt).